how much is that blue crab in the window? the one with the big shiny pinchers? I went to New York City back in February for a check-up with my Lyme-literate MD. I intended to post this travel recap back then, but somehow it slipped my mind. Better late than never, I suppose! February's trip to the Big Apple was a victory. I have now gone to New York three times for appointments over the last year and a half, and the difference I notice each time I go in how I feel is amazing. Traveling removes you from your daily routine and the patterns of how you feel - it is such an incredible way to strip you down to a baseline. And you know what? I feel better. The first time I went in December 2009, New York totally destroyed me. I had a great time explore, but I had to take breaks going up the stairs from the subway, felt completely exhausted at the end of each day, and spent the next week after I returned trying to recover. This last trip I found myself skipping up stairs, running down stairs, and walking all day, without feeling like I was on a torturous death march or needing to take breaks constantly. Ladies and gentleman, it's official: I really am getting better. I feel so grateful. In addition to exploring the city, I met up with my friend Kim Trick from Steph and Kim (formerly Wallet-Friendly Wellness). I stayed with Kim and her sister Steph when I was in NYC last summer. Despite talking a lot online and through the blogosphere, we had never met before I arrived at their doorstep last July. I was touched at their generosity and willingness to invite me into their home, and we really hit it off and had a ton of fun together. Needless to say, it was a pleasure to catch up with Kim again. We spent the afternoon in a cute Brooklyn café, discussing everything from Lyme to nutrition to grad school to religion to boys. Fun! Other than walking around a lot, I ate. In fact, I ate a lot and drank a lot and pretty much felt like I consumed half of Manhattan. I didn't have a lot of cash flow after paying for my doctor appointment and didn't go out to eat at very many restaurants, my friend Matthew and I mostly cooked at his place for breakfasts and dinners. But, as always, I did my fair share of tourist snacking while wandering the city. Oddly, I didn't take a lot of photos during this trip, probably because it was cold and my hands didn't want to come out of my gloves! 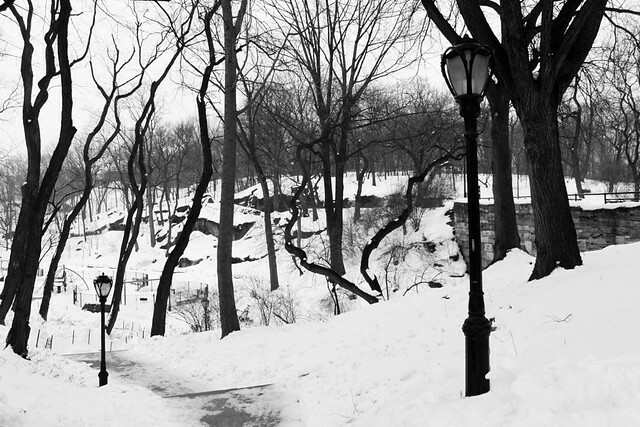 New York City is weird in the winter because there really isn't snow anywhere other than Central Park. Coming from Minneapolis, where snow collects everywhere and takes over the streets, I saw this was a very strange phenomenon. 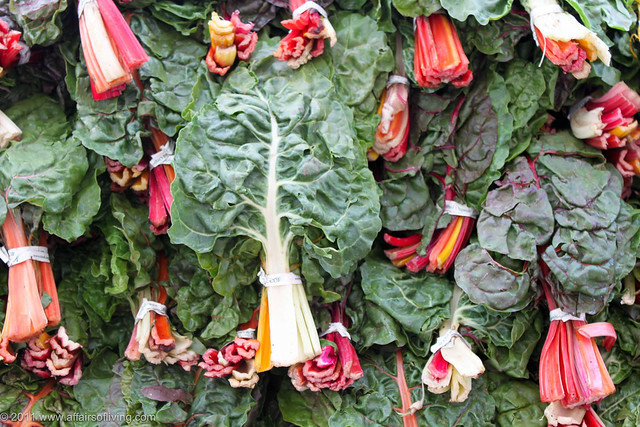 Look at the difference between Central Park and the Union Square Greenmarket - it looks like two different cities and seasons! I recently returned from a trip to visit a friend in Berkeley, California. 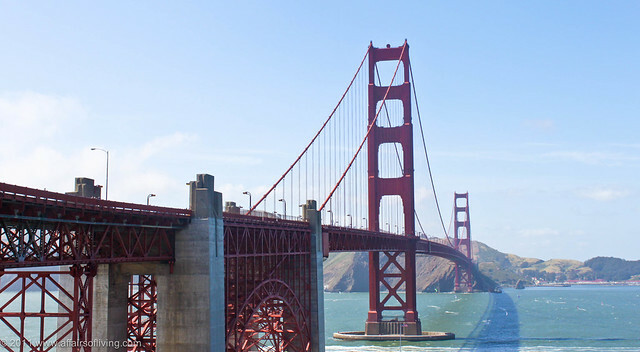 I spent 5 glorious days roaming the San Francisco Bay area, hitting up tourist destinations and wandering lesser visited areas too. The Bay Area is a wonderland of gluten-free, allergy-friendly, whole foods places. Put simply: I did not suffer. Quite the opposite, really - I think I ate my way through Northern California! I wanted to share some of my favorite food destinations with you, as well as some other sites from my trip. I hope you enjoy! 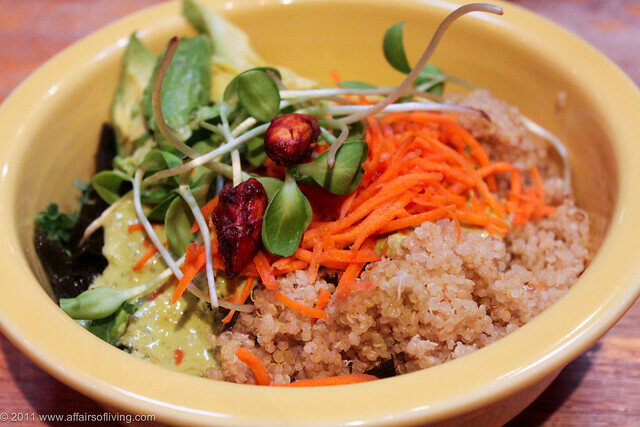 "Café Gratitude serves a menu of 100% organic, 100% vegan, local fare. Our food is free of refined sugar, flour, and additives. We have an extensive menu of raw foods and have recently expanded to serve cooked foods in many of our locations. We create all of our own food -from the produce bin to your plate - so we can avoid serving certain common allergens like wheat, soy, and peanuts. Over 45% of our produce comes from our Be Love Farm, and the compost from our Cafes is returned to the farm to nourish the next meal." My burning desire to go there was happily obliged by my friend and host, as we ended up going there three times in five days! Seriously. Two of the trips to Cafe Gratitude involved a meal. Due to the large number of items on the menu that include nuts or other allergens for me, my options were somewhat limited. Thankfully, the item on the menu that looked the best to me was also totally Kim-friendly. Named "I Am Whole", this bowl was a mixture of kale, carrots, quinoa or rice, homemade sauerkraut, sunflower sprouts, and sea vegetables, all doused with a garlicky lemon tahini sauce. I added sliced avocado (an extra charge), and asked for the tamari almond garnish to be left off. The portion was enormous, and it looked gorgeous. The flavor was fresh and clean, and the meal left me feeling satisfied and energized. 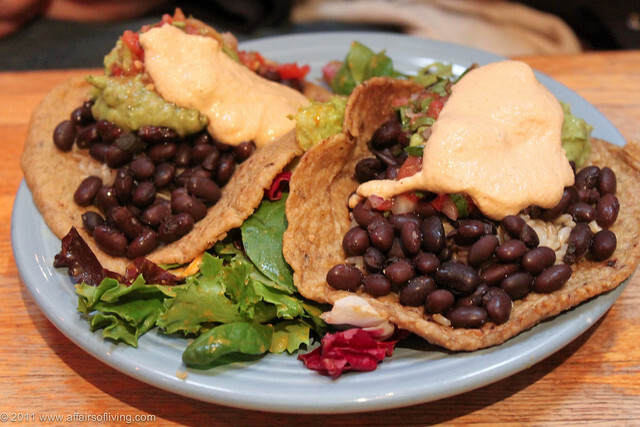 My friend ordered handmade corn tortillas with beans, avocado, salsa and homemade cashew-almond "cheese". He adored it, and ordered the second time we went back! 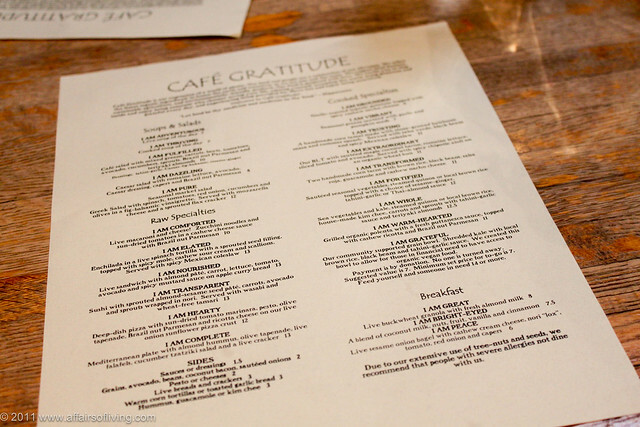 The environment at Cafe Gratitude is really soothing and calm, and I very much enjoyed it. It is, in some ways, what you'd expect - unbleached cotton napkins, glass water carafes etched with inspirational words, dialogue cards on each table. And on Fridays a darling, purple-clad woman named Ari gives angel readings. She read my angels and was pleased to find out that they totally have my back and are supporting all kinds of things I want to do in life. I also tried their housemade kombucha. I tend to prefer a bitier, more sour kombucha, and although theirs was a little more sweet, I still enjoyed it. It had a very gentle fizz that was present but not very aggressive. In addition to a full menu, Cafe Gratitude has a bakery/dessert case, a cooler case of packaged edibles, and a wide variety of specialty ingredients, cookbooks, apparel, and home goods. So, the other trip to Cafe Gratitude was merely for treats. 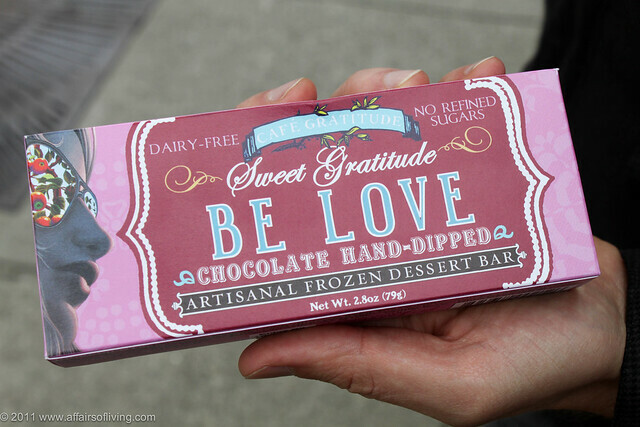 I purchased the "Be Love" ice cream bar, made of coconut milk, cashews, agave nectar, vanilla bean, and dunked in a raw cacao chocolate shell. Honestly, I wasn't totally wowed. The texture of the ice cream wasn't as creamy as I would have liked - it was hard and full of ice crystals - but the flavor was good. 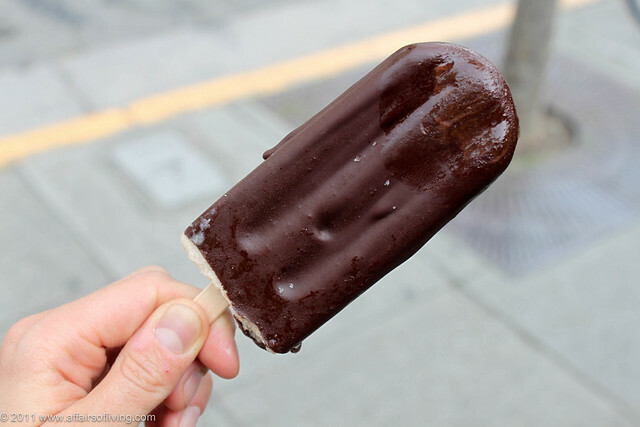 I loved the chocolate shell, a dark and bitter chocolate that wasn't too sweet at all. By the time I was almost done with it, it had softened up to a more desirable texture, so maybe the trick is to let it sit out a bit before eating. Either way, it satisfied my craving for something cold and sweet. I also purchased a package of Lemon-Coconut Raw Cookies (no photo, sorry). These things were fantastic, made of shredded coconut, lemon juice, agave nectar, sea salt, and a few other ingredients and dehydrated into a sweet and chewy treat that is absolutely addictive. I don't remember how much they cost, but they were absolutely worth it. I absolutely recommend Cafe Gratitude to anyone looking for a wholesome meal. Next time I visit the Bay Area, I'd like to visit Gracias Madre, the sister restaurant in the Cafe Gratitude chain. It specializes in organic vegan Mexican-inspired food, which sounds like a winning combination to me. 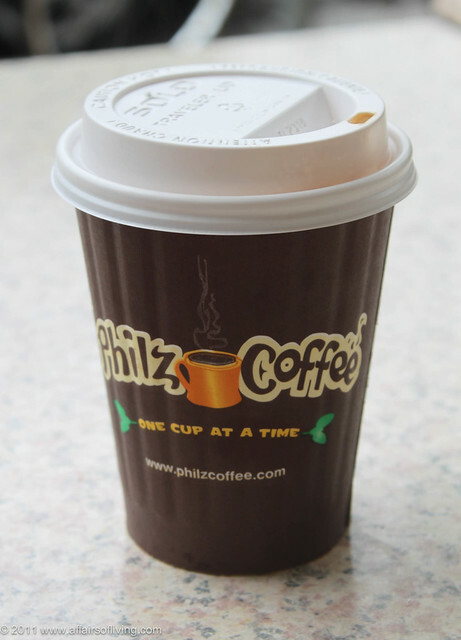 Voted the best coffee in San Francisco by SFWeekly, Philz Coffee was an absolute revelation. My friend and host proudly names this establishment as his favorite coffee indulgence, so we made sure to go the first morning I was in town (and also the last morning I was in town, actually). I walked in the cafe to find a wall of coffee beans, cheerful baristas, and a bakery case full of fresh baked goods (including vegan options) and two shelves of packaged, locally made gluten-free cookies and brownies. What makes Philz so special is that each order is brewed one cup at a time, to the patron's specifications. There were probably 20 different types of roasts and blends, both regular and decaf. It takes a little longer than your average cup of joe, but the results are breathtaking. I actually moaned a little bit when I took my first sip of Decaf French Roast. Their only non-dairy milk option is soy milk, so I opted for a splash of organic whole cow's milk in my order. It was the most divine cup of coffee ever; bold, dark, earthy, bitter, and almost a little smoky. I also indulged in a pre-made gluten-free Peppermint Chocolate Chip cookie. It was an absolutely indulgent way to start the day! Then we went to Cafe Gratitude and I ate my body weight in that I Am Whole bowl. I arrived in California hungry and tired. I needed food immediately! My friend and I decided on a Greek dinner at Ikaros Greek Restaurant, which he had never been to but had heard good things about. In short: it was wonderful. The server was friendly and knowledgeable and very accomodating with my dietary needs. While the kitchen certainly is not gluten-free, they were allergy aware and I was able to get a very wonderful meal. We started the meal with dolmas (stuffed grapeleaves), which were freshly prepared and flavorful. 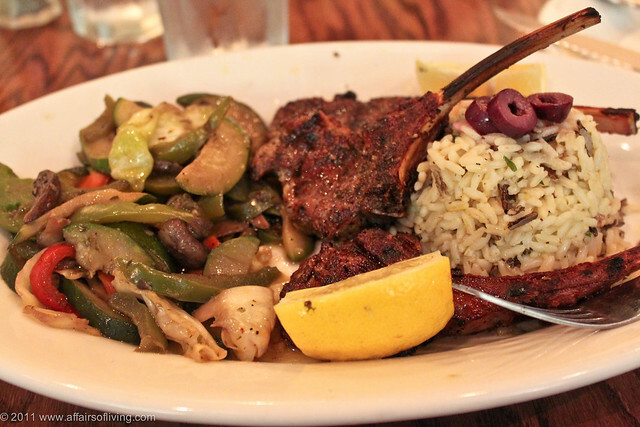 For my main course, I had marinated lamb chops, sauteed vegetables, and herbed rice. My friend ordered a lemon roasted 1/2 chicken, which also came with rice and vegetables. We also got a simple salad of shredded cabbage, carrot, lemon juice, and olive oil. The meal was heavenly! My lamb chops were so tender and flavorful, perfectly done and just a little charred. My friend's roasted chicken was moist inside with a wonderfully crisp, flavorful skin. The rice pilaf was buttery and flavorful, each kernal of rice perfectly done. The vegetables were the low point, which were a little too oily and overcooked for my taste. On the flip side, the cabbage salad was very good, a welcome light and crisp addition to our heavier meal. I would definitely recommend this restaurant - the prices were reasonable and the quality was excellent. I don't have any food photos to share, but this place was very good. The only Turkish restaurant in Berkeley, The Turkish Kitchen serves a wide variety of authentically prepared Turkish foods. While it wasn't extremely safe for gluten-free folks (no dedicated fryer, wheat everywhere in the kitchen, and a limited understanding of allergy needs), I was able to find a good and safe meal after a little trial and error. The falafel was fantastic (with no wheat in the mix), but is fried in a fryer that is shared with gluten. I also had hummus and a very nice salad. Beware, however - the rice is actually a rice pilaf, and contains orzo, a fact that wasn't made clear to me until it arrived at my table. If you have a wheat allergy, please don't eat the rice. In addition to a wide variety of delicious meat dishes, The Turkish Kitchen also had lots of options for vegans and vegetarians. The food was delicious and affordable, and it worked for me, as I can share equipment/fryers/etc with wheat from time to time and be okay. But if you are extremely reactive, I wouldn't recommend it. 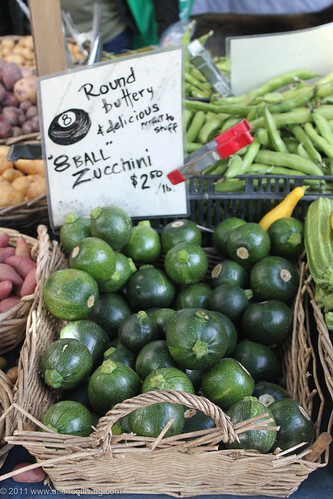 One of my favorite things to do when traveling is find the local farmers market. In the case of the Bay Area, my friend presented me with four different markets we could attend that were near to his home. 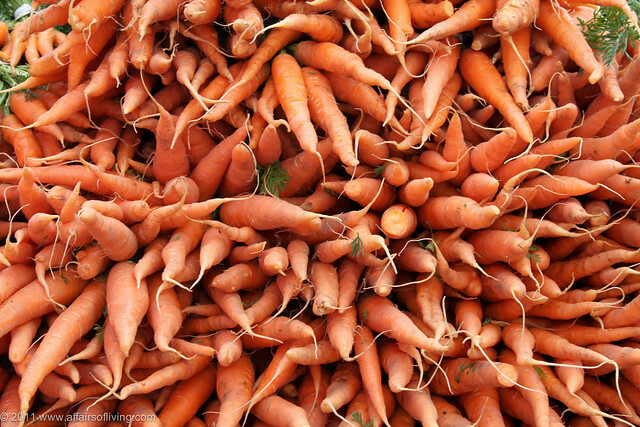 We chose to attend the market he frequents most often, the Grand Lake Farmers Market. Located near Lake Merritt, this market is in a very urban, busy location in the city, just off the highway. But once you enter the tent community, you feel transported into an agricultural wonderland. This market had it all: fresh fruit and vegetables, locally raised cuts of meat and locally produced charcuterie, freshly prepared tacos and tamales, honey, breads and other baked goods, locally grown dry beans, mushrooms, milk, cheese, yogurt, eggs, and more. I was impressed at the wide variety of unique this as well - Easter egg radishes, unusual wild greens, foraged mushrooms, flavored honeys. Also, it was so amazing - alarming, really - to see so much fresh fruit at the market. It's cherry season, so there were cherries everywhere, and fresh locally grown avocados. The notion of being able to get fresh, locally grown avocado is somewhat of a miracle to this northerner. Beyond the wide variety, I was truly wowed at the presentation. Most vendors went out of their way to produce a beautiful display for their foods, and I found myself charmed on a constant basis. Since we were on the move that day and not cooking, I had to limit my purchases. Nonetheless, I left with Duck Rillettes, a Smoked Cured Duck Breast, fresh pea pods, and dry gigante beans. I don't know what I was thinking not getting a big bag of cherries for snacking! At the Splash Pad Park on the corner of Grand Ave and Lake Park Ave. I just returned from 6 days visiting friends in Washington state. It was the perfect vacation - a balance of town and country, old friends and new, sun and rain, and lots of delicious food. 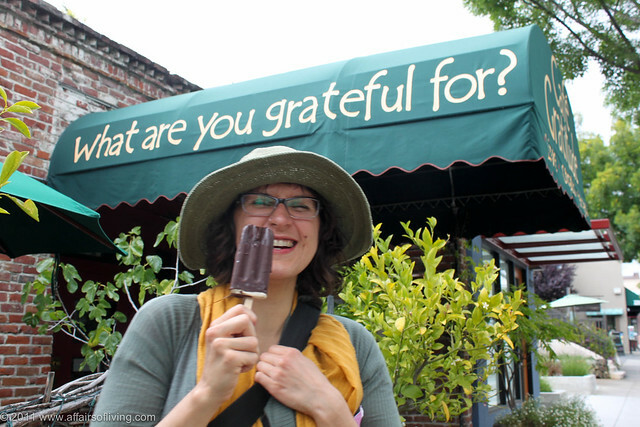 I ate my way through Seattle, Port Townsend, and Woodinville, and enjoyed every last bite. One of my favorite things about traveling is food. Trying local specialties, checking out farmer's markets, cruising through co-ops, eating at independently owned restaurants - these are my favorite ways to see the heart of a community and satisfy my never-ending food curiosity. Washington is perfect for this. 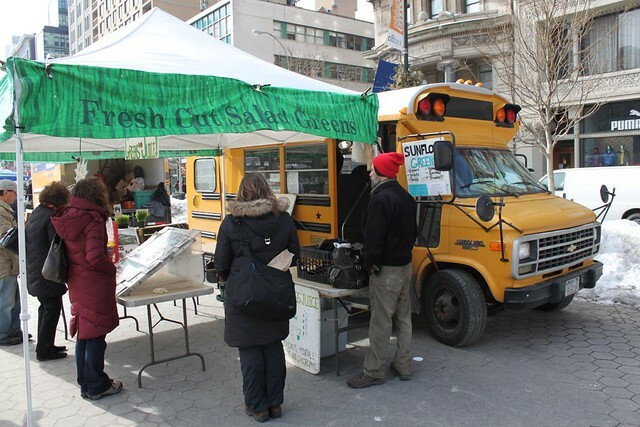 In addition to amazing restaurants and natural grocers and co-ops, the prevalence of road side produce stands and wild edibles makes this state like a big buffet. 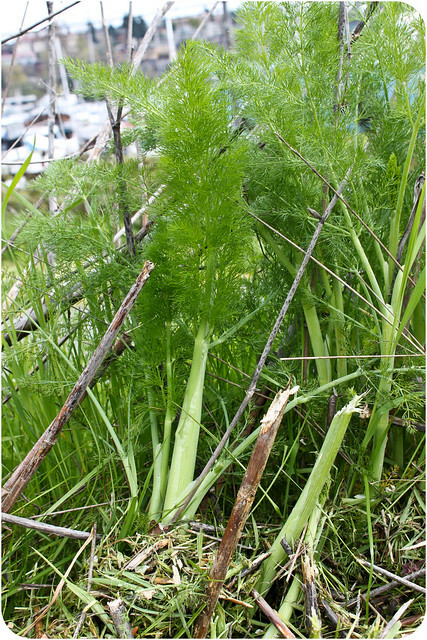 I saw slews of blackberry bushes and wild fennel growing along a sidewalk in Seattle for goodness sake. 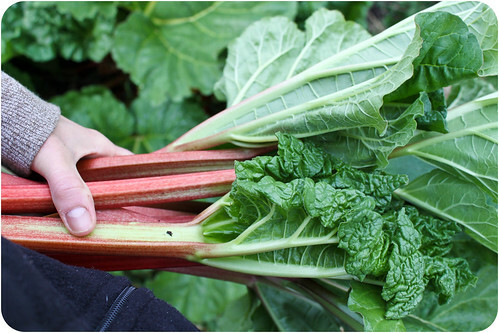 And unlike the gardens here in Minnesota (which were covered in snow this morning), the gardens around Seattle are already yielding beautiful produce. I am resuming the planning process for moving to the Pacific Northwest. One of the most interesting food items I saw for sale were bunches of rutabaga raab for sale at the Port Townsend Food Co-op. 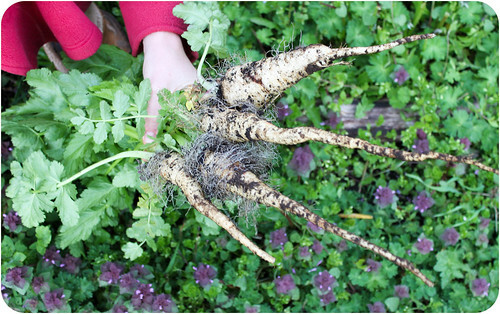 Rutabaga raab is nothing more than the flowering tops and tender leaves of the rutabaga plant. 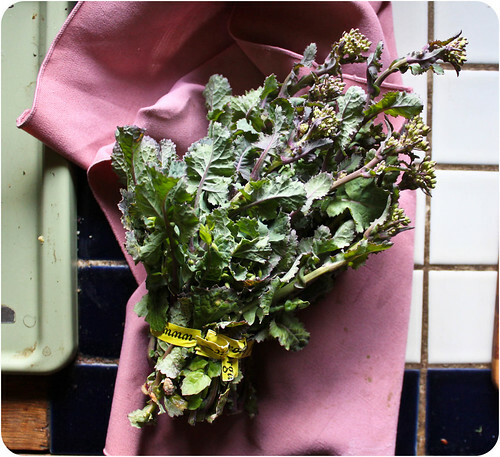 I laughed when I saw the bunches being sold for $1.99 each, because I generally pick the tender leafy flowering tops from my kale and mustard plants and use them right along with the greens. 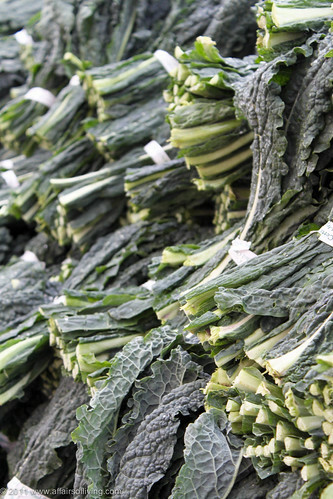 But you never see these in stores, and I never thought of using rutabaga greens! 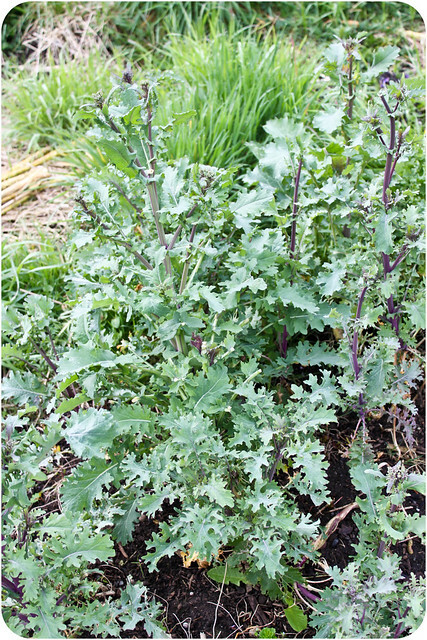 Rutabaga greens are not often used, or even available, and when you do find them, they never have the tender flowering tops. Because the rutabaga is better stored without the leaves, they usually get discarded before the rutabaga even gets to market. So, rutabaga raab is really something you'd only have access to if you were growing rutabaga yourself or, apparently, if you live in Port Townsend. First of all, happy new year! Can you believe it is 2011? A new year, a new decade. May the new year bring you much inspiration, happiness, health, and peace of mind, and in doing so, allow you to heal the world and bring joy to those around you in small ways everyday. We all have the power to make positive change this year, for ourselves, for each other, and for our planet! here's to a great 2011, for all of us. Now, let's talk about food. 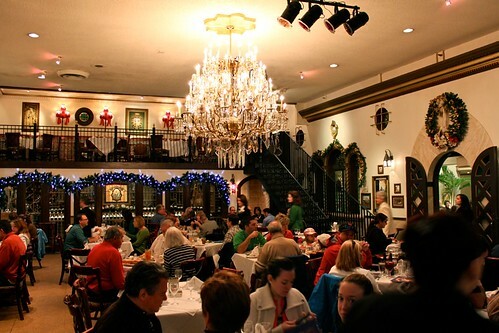 Really good Spanish food, to be exact.While in Florida for Christmas, my parents and I went to the Columbia Restaurant in Ybor City, the historical neighborhood located in the city of Tampa, Florida. 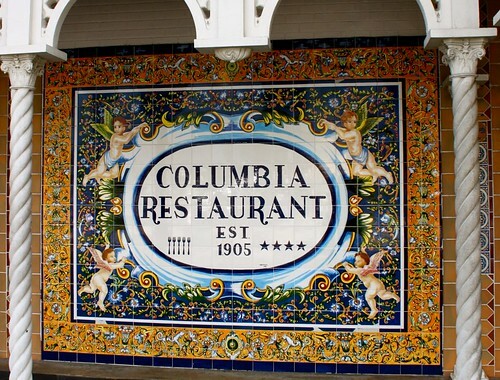 The Columbia Restaurant was founded in 1905 and is the oldest restaurant in Florida and the world’s largest Spanish restaurant. Founded by Cuban immigrant Casimiro Hernandez, Sr., it began in Tampa’s Ybor City, as a small corner café known for its Cuban coffee and authentic Cuban sandwiches, frequented by the local cigar workers. Over the years, the restaurant has grown. It expanded to five other locations in Florida: St. Armands Circle in Sarasota, the Historic District in St. Augustine, The Pier in St. Petersburg, Sand Key on Clearwater Beach, Central Florida’s town of Celebration, and the Columbia Café at the Tampa Bay History Center, Channelside. 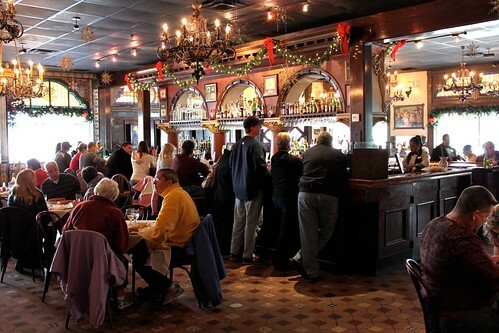 All Columbia Restaurants are owned and operated by 4th and 5th generation members of the founding family (read the entire history here). The Columbia has been named an All-American Icon by Nation's Restaurant News, one of only fifty restaurants in the U.S. chosen for this honor. The Tampa location is lovely to behold. 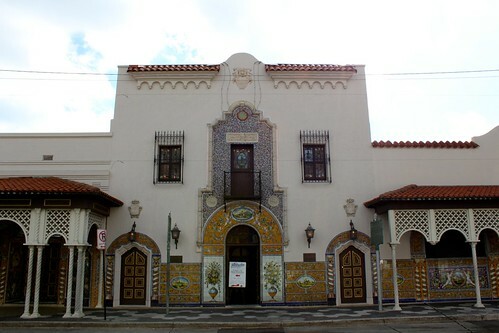 The exterior is covered in Spanish tile, a reference to the Moorish tiles of Southern Spain. Inside, there are multiple opulent dining rooms, each offering a different environment and feel. After glancing in the old café room, and walking through the richly decorated Don Quixote dining room (outfitted with a large crystal chandalier and dark woodwork), we were shown to the Patio Dining Room, a sunny and bright room designed to mimic the patios of Andalucia. It was built in 1937, and I felt as though I were being transported back in time. Waiters busily hurried about the dining room in black tuxedos, scraping bread crumbs off tables and adjusting the folded cloth napkins. Large green palms dotted the room, providing lovely contrast to the white marble floor, crisp white tablecloth, and white walls. A fountain in the center provided the soothing sound of running water. Holiday greenery tastefully hung from the railings of the second story, providing a festive touch. I am spending the holiday weekend in Orlando, Florida, hanging out at my brother and sister-in-law's cozy little apartment. My parents drove down from Wisconsin and I flew down from Minnesota, and the warm Florida sunshine is a welcome departure from the wildly snowy, grey weather up north. The weather in Florida has been marvelous, perfect for sitting outside playing cribbage and telling stories, going on walks, and simply enjoying the sunshine. I forgot that there are many parts of the world where things remain colorful, sunny, and green all year round, and this has reminded me that I need to get away to warm places more often during the cold Minnesota winters. I don't even want to think about the snow back home, and I'm sure my parents don't either. I mean really, when this snowy mess (otherwise known as my parents' house) is what the northern Midwest has to offer right now, why wouldn't we want to see all this beautiful color that Florida has to offer? Why deal with this in Wisconsin and MInnesota when you could have warm, sunny weather and flowers in Florida? little purple lovelies my brother and me palms at Christmastime! Hibiscus are one of my favorite flowers. I'm always amazed at the way that trees become habitats for so many other plants and animals, especially in warm climates. This tree had lichen and two other varieties of plants growing on the bark. Amazing. Of course, since this is a food blog, I have to talk about what we have eaten thus far. We have eaten lots of great food together so far. 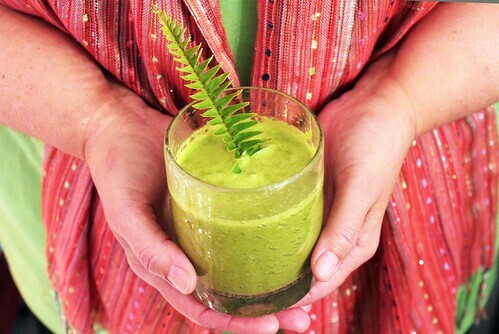 My mom brought down their Vitamix, so we have been able to make lots of delicious green smoothies. The warmer temperatures left me craving fruit and raw foods, which is an unusual departure from my normal winter desires for warm stews, meatloaf, and starch! So, the smoothies were a welcome addition. In addition to smoothies, I have made lots of other things, like roasted butternut squash, seared Brussels sprouts with apples, chickpea and celery spread, roasted cauliflower and broccoli, and a wonderful clean-out-the-fridge leftover soup. I made awesome red curry with chicken, squid, and fresh vegetables, served with quinoa (I will share that recipe soon!). And my dad made grilled salmon and grilled mahi mahi that brought us to our knees. Since the holiday always makes me want to bake, I did spend plenty of time whipping up sweet treats to satisfy the cookie craving. I made raw "trail mix" truffles, a nice mixture of a Larabar, dried apple juice-sweetened cranberries, homemade trail mix, and coconut oil. We ate those on Christmas Eve instead of cookies, and they absolutely satisfied everyone's taste buds. Later on, I dug through the pantries and my mom's snack box, and managed to throw together a really delicious breakfast scone/biscuit/cookie thing, made from freshly ground rice flour, oatmeal, apple sauce, finely shredded carrot, among other things. Everyone loved it, and I'm going to refine that recipe and share it in my next recipe collection. 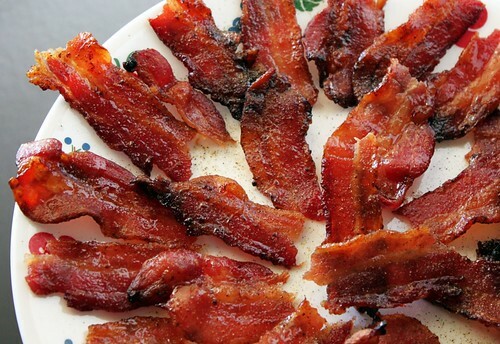 But the real star of the kitchen thus far has undeniably been the maple-candied bacon we ate on Christmas morning, accompanied by green smoothies.